Raumfahrt+Astronomie-Blog von CENAP - Blog: Astronomie - The inner planets of the TRAPPIST-1 system might get melted by induction heating. In the search for new planets, a lot of the focus has been on finding some that reside in what's called the habitable zone. This is an area between where a planet's orbit receives enough starlight to keep water liquid, but not so much light that it all boils off as steam. Planets in habitable zone orbits are expected to have better prospects of harboring life as we know it from Earth's example. But it's important to recognize that habitable zone doesn't mean habitable. If a habitable zone's planet's surface reflects enough light, it could end up as a frozen snowball. If its atmosphere has enough greenhouse gases, it could end up a baking hell like Venus. Now, a team of European researchers has identified something else that could have an immense effect on habitability: the star's magnetic field. Under the right conditions, planets close to a star will experience a strong but variable magnetic field, which can cause induction heating. In the case of one system with several habitable zone planets, the induction heating could be strong enough to convert them into oceans of magma. Induction heating is a process we sometimes use on Earth. It relies on sweeping magnetic fields across metallic objects. These fields get electrons moving, creating small loops of current, termed "eddy currents." Those currents experience some degree of electrical resistance, which turns the entire metal into a weak resistance heater (think of the red, glowing coils in a portable space heater). With a strong enough magnetic field, the heating can be intense. The same effect can work in non-metals. Obviously, the amount of current will be smaller, but the resistance the object faces will be larger. This isn't an issue in our solar system, because planets and moons are mostly far enough from other sources of magnetic fields to experience significant heating (with the possible exception of Jupiter's moon Io, where any induction heating is swamped by gravitational tidal heating). But lots of exosolar systems have planets in close proximity to their host stars, which may have strong magnetic fields. To get induction heating to work, however, you need a magnetic field that changes relatively rapidly. From a star, this requires a rather particular set of circumstances: the star itself has to rotate rapidly, and its magnetic poles have to be offset a bit from its axis of rotation, just as the Earth's magnetic poles aren't at the geographic poles. With this combination, the star's rotation will sweep its magnetic field across any planets that orbit it. The European team behind the new report focused on M dwarf stars. Because these are small, relatively cool objects, their habitable zones are close to the star and well within the region where the star's magnetic field is quite strong. They also have magnetic fields that are strong to begin with, sometimes in the area of thousands of Gauss. The magnetic field of our Sun is typically 10 to 1,000 times weaker. Not all M dwarfs rotate quickly enough for this to matter. Proxima Centauri, which hosts the closest known exoplanet, takes more than 80 days to complete a rotation. But there is a nearby M dwarf that completes a rotation in only three days: TRAPPIST-1, which hosts at least seven planets, three of them in the habitable zone. So, the team decided to model how much of an effect induction heating might have on these bodies. TRAPPIST-1 has had its magnetic field measured at 600 Gauss, but the authors used an earlier estimate of its rotation period (1.4 days vs. the present estimate of 3.2 days). That probably exaggerates present day heating but may reflect earlier conditions, as stars tend to slow their rotation as they age. The key unknown, however, is the composition of the planets. The amount of induction heating possible is very sensitive to the materials that are being heated, but at present there's no way of determining what these planets are made of. The team assumed an Earth-like composition, but results could change significantly based on the actual materials that formed the TRAPPIST exoplanets. In this model, the inner-most planet's orbit, which takes 1.5 days, was a rough match for the star's 1.4-day rotation. As a result, the magnetic fields swept across it relatively slowly, so induction heating wasn't a major factor. At the present estimate of the star's rotation, no planets will end up seeing this benefit. The three outer planets are far enough from the star that they don't see much heating, either. That leaves the three planets in between these groups, one of which resides in the habitable zone, to examine in detail. Here, induction heating has a somewhat counter-intuitive effect. The star's magnetic fields are at maximal strength at the surface; as you move toward the interior, eddy currents induced in the layers above act as a shield, limiting the strength of the magnetic field. As a result, these planets end up heated from the surface-inward rather than from the core-out like on Earth. The peak heating actually occurs only 10 percent of the way toward the planet's core. And the heating is rather substantial. 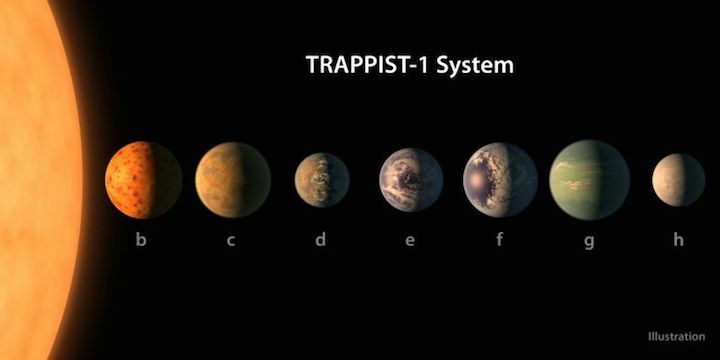 For TRAPPIST-1c, the third planet out from the star, induction heating reaches more than 60 percent of the heat released in the planet by radioactive decay. That's enough to melt the entire surface, turning it into a magma ocean in nearly all the different model conditions sampled. The same conditions are likely on TRAPPIST-1d, the one in the habitable zone, where induction heating can be above half the amount of heat released by radioactive decay. The process, however, may be self-limiting to a degree. Molten minerals tend to be better conductors, which means stronger eddy currents. Although this means more energy released at the surface, it limits the depth to which the magnetic field can penetrate. As a result, the total heating ends up lower, and the prospects for a magma ocean go down a bit. Other conditions, like the cycling of material through plate tectonics, can moderate the effect of induction heating. An active planetary magnetic field would also provide some shielding (the researchers assumed none was present). In any case, the models make a persuasive case that induction heating will increase volcanic activity on these worlds. And that would have a complicated relationship to habitability. Volcanic activity can cycle up water and carbon dioxide to the planet's surface, restoring an atmosphere if it were lost due to earlier eruptions on the nearby star. That atmosphere, however, would likely create a potent greenhouse effect, making these planets too hot for habitability, given that they're near the inner edge of the habitable zone. The huge number of assumptions about composition and internal structure required to make this model work mean that it should be viewed as an indication of what could be happening on exosolar systems like this. It's also a general caution; it's easy to get excited about habitable zone planets, but we have a lot of work to do to understand whether they're actually habitable. That work includes fully understanding their stars, atmospheres, and planetary composition. And, unfortunately, there's no technology on the horizon that will get us the planetary composition any time soon. Nature Astronomy, 2017. DOI: 10.1038/s41550-017-0284-0 (About DOIs).